SNES DoReMi Fantasy: Milon no DokiDoki Daibouken (JPN) in 1:01:20.5 by Mukki. 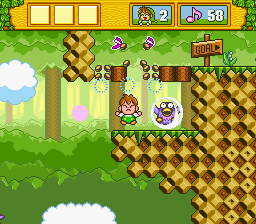 DoReMi Fantasy is ostensibly the Japan-only sequel to Milon's Secret Castle, though in practice it turns out to be a very different game, as it just a plain platformer with no big puzzle elements. Milon has set out to travel through seven different worlds to bring music back to the world (courtesy of his home town's forest) and rescue his friend from the clutches of an evil wizard (who, conveniently, is also responsible for causing the music to disappear).